June 14, 2017 9:04 A.M.
Ontario is partnering with the Canadian Men’s Health Foundation (CMHF), providing funding to encourage men to make small changes in their lives that can make a big difference to their health. 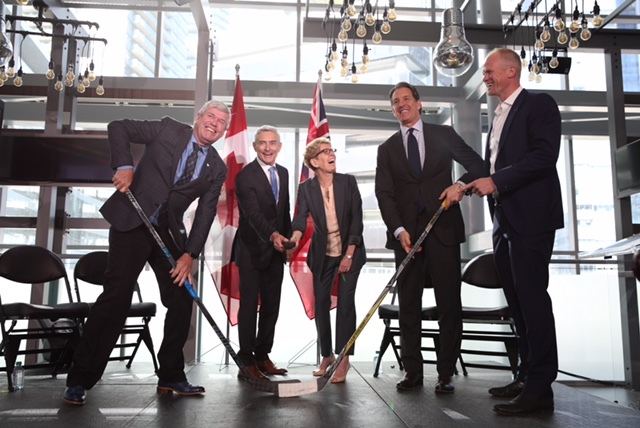 Recognizing Canadian Men’s Health Week, Premier Kathleen Wynne was joined by CMHF President Wayne Hartrick and Toronto Maple Leafs President Brendan Shanahan at the Air Canada Centre in Toronto to announce the province’s support for a series of CMHF initiatives to promote healthier lifestyles for men. The health statistics are alarming — according to the CMHF, men are 40 per cent more likely than women to die from cancer and 70 per cent more likely to die of heart disease. These increased risks can be directly linked to nutrition, exercise, alcohol consumption and smoking, meaning simple lifestyle changes can significantly improve men’s overall health. CMHF is promoting small steps such as sleeping seven to eight hours per night, consuming no more than 15 alcoholic drinks per week, eating eight to 10 servings of fruit and vegetables per day, and exercising for 150 minutes every week. Ontario is providing $5 million over five years to support CMHF’s work to increase men’s health literacy, improve research and data collection, reach men in ethnic communities who are at increased risk, and engage with health care professionals and chronic disease organizations to help men make better health decisions. CMHF’s work complements other government initiatives that will improve men’s health outcomes, including support to help smokers quit, education on the risks of misusing alcohol and OHIP coverage for screening tests for men suspected of having prostate cancer. Ontario is increasing access to care, reducing wait times and improving the patient experience through its Patients First Action Plan for Health Care and OHIP+: Children and Youth Pharmacare — protecting health care today and into the future.  June 12 to 18 is the fourth annual Canadian Men’s Health Week.  Ontario is providing $5 million over five years to CMHF, a non-profit organization that encourages men and their families to become proactive about their health.  In 2015, more male than female Ontarians ages 12 or older reported that they smoked cigarettes (21 per cent versus 15 per cent), drank alcohol heavily (24 per cent versus 14 per cent) or ate unhealthy foods (72 per cent versus 66 per cent). I was not familiar with the CMHF until I saw Wayne Hartrick interviewed by Steve Pakin on TV Ontario’s The Agenda last night. I was impressed with both Mr. Hartrick’s clarity, earnestness and passion regarding men’s health. I also think the ‘Don’t change much’ idea and website is a wonderfully simple, smart and, hopefully, effective approach. As a retired social worker/mental health worker, I have a particular interest in mental health and men’s mental health, and am wondering what future initiatives, if any, you might have in the works in that particular area of men’s health and how a man like me might learn more and/or get more involved in the CMHF? Thanks GW for you comment.The CMHF and our partners appreciate the recognition. At the present time all out initiatives are delivered in the digital sphere, but we suggest visiting DontChangeMuch.ca or menshealthfoundation.ca in the future to see if there are ways you can participate.